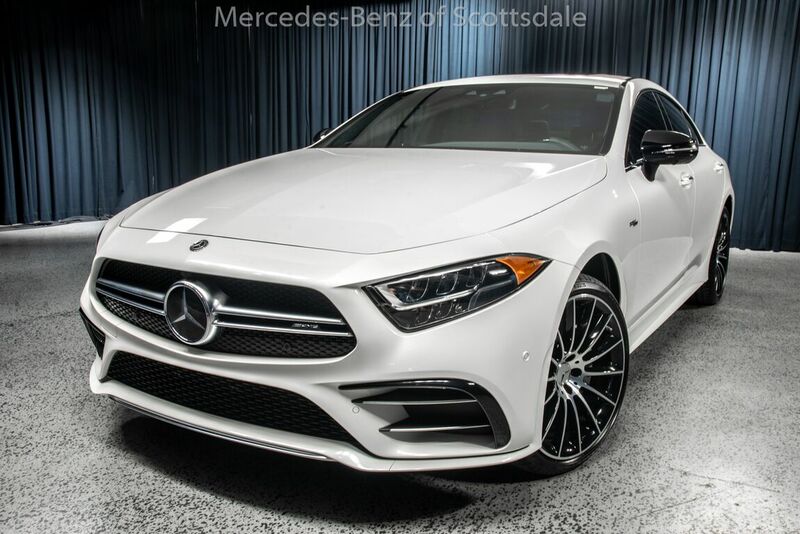 This outstanding example of a 2019 Mercedes-Benz AMG CLS 53 S 4MATIC is offered by Mercedes-Benz of Scottsdale. This Mercedes-Benz includes: PARKING ASSISTANCE PACKAGE Automatic Parking Back-Up Camera ACTIVE MULTICONTOUR FRONT SEATS W/MASSAGE FEATURE Seat-Massage Power Passenger Seat Power Driver Seat Bucket Seats BURMESTER HIGH-END 3D SOUND SYSTEM Premium Sound System DESIGNO DIAMOND WHITE HEATED & ACTIVE VENTILATED FRONT SEATS Cooled Front Seat(s) Heated Front Seat(s) BENGAL RED/BLACK, NAPPA LEATHER UPHOLSTERY Leather Seats DRIVER ASSISTANCE PACKAGE Lane Departure Warning Lane Keeping Assist Brake Assist Adaptive Cruise Control WARMTH & COMFORT PACKAGE Heated Steering Wheel Heated Front Seat(s) *Note - For third party subscriptions or services, please contact the dealer for more information. * You deserve a vehicle designed for higher expectations. This Mercedes-Benz CLS-Class delivers with a luxurious, well-appointed interior and world-class engineering. Enjoy the comfort and safety of this AWD Mercedes-Benz CLS-Class AMG CLS 53 S 4MATIC equipped with many standard features found on other vehicles as optional equipment. Marked by excellent quality and features with unmistakable refined leather interior that added value and class to the Mercedes-Benz CLS-Class Contact Mercedes-Benz of Scottsdale today for information on dozens of vehicles like this 2019 Mercedes-Benz CLS AMG CLS 53 S. There's a level of quality and refinement in this Mercedes-Benz CLS that you won't find in your average vehicle. Enjoy driving? Well now you will get more thrills behind the wheel thanks to the heightened performance of AWD. Better handling. Better traction. Better driving experience. This is the one. Just what you've been looking for. This is about the time when you're saying it is too good to be true, and let us be the one's to tell you, it is absolutely true.